EPI’s Josh Bivens delivered the following testimony before the Council of the District of Columbia’s Committees on Education, Health, and Finance and Revenue regarding the Bolstering Early Growth Investment Amendment Act of 2017 on September 27, 2017. My name is Josh Bivens, and I am the Director of Research at the Economic Policy Institute (EPI) in Washington, D.C. I’d like to thank the committee for the opportunity to testify today before the Council of the District of Columbia’s Committees on Education, Health, and Finance and Revenue on the Bolstering Early Growth Investment Amendment Act of 2017. Thanks to Committee Chairs Grosso, Gray, and Evans, and particularly to Councilmember Robert C. White, for introducing and bringing to the forefront legislation on this important issue, and to the Committee staff for organizing. EPI is a non-profit, non-partisan research institute committed to ensuring that the economic interests of low and middle-income families are given their proper due in economic policy debates. We try to identify policies that will both boost economic growth and ensure that this growth is widely shared across the economy and not just claimed by a select few. 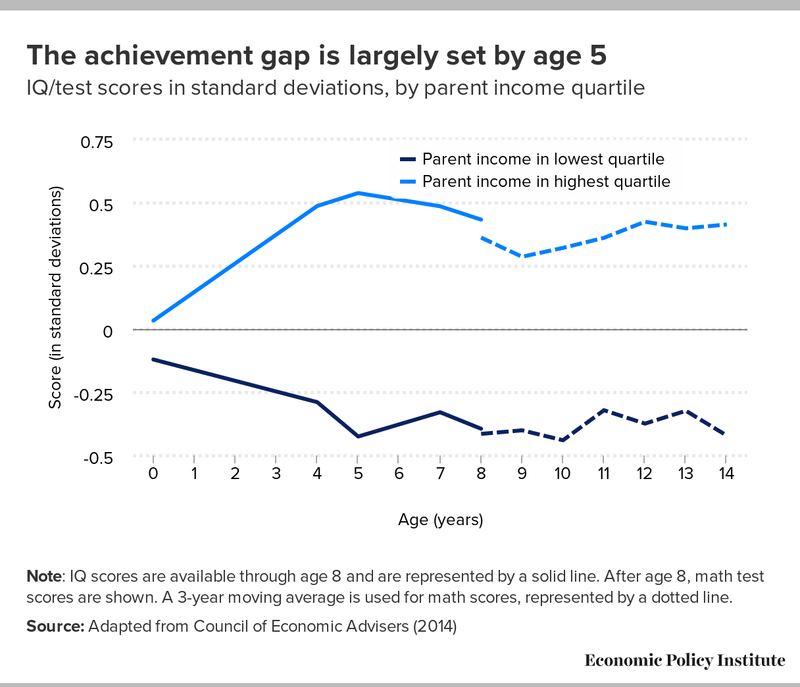 It is hard to think of any other policy lever that spurs broadly-shared growth more effectively than investments in early child development. Such policies provide both short-term and long-term benefits to economic growth and economic mobility. Because the evidence on these topics is so overwhelming, and time is short, I’d like to submit a 2016 paper into the record that I co-authored with colleagues at EPI that provides the facts and evidence that supports these comments. In the short-term, providing high-quality childcare and education options to parents who don’t currently have them or cannot afford them is a crucial work support that boosts labor force participation. Because women have traditionally borne the much-larger share of the responsibilities for childcare, policy interventions that provide high-quality options to families with children will disproportionately increase female labor force participation. 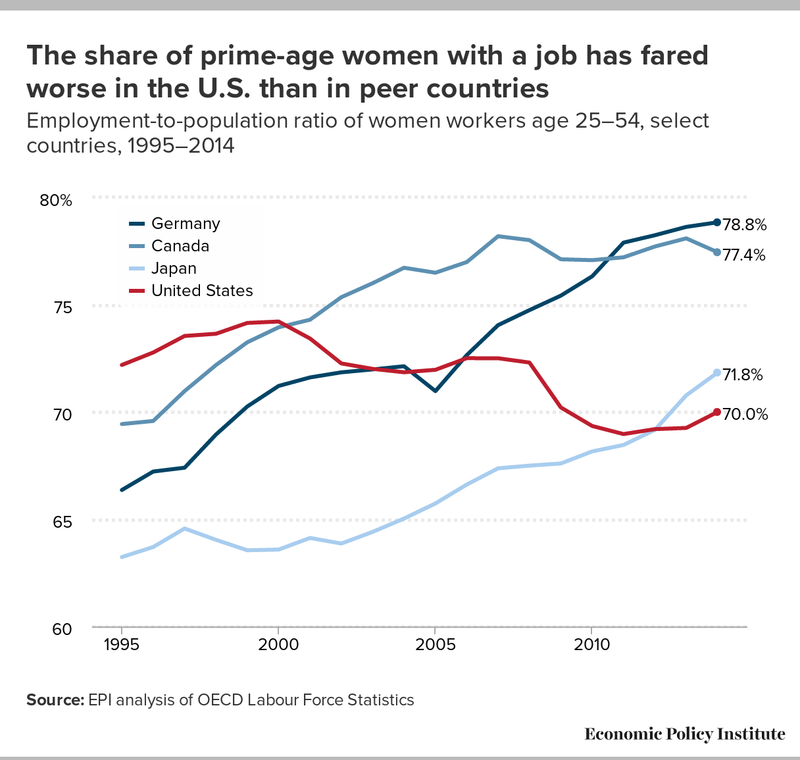 This has the potential to reverse a troubling decline in women’s labor force participation in the United States relative to many of our advanced industrial peers (as demonstrated in Figure 1 below). In the early 1990s, female labor force participation in the United States was among the highest in the advanced world, ranking 6th out of 22 advanced economies. By 2010, the U.S. ranking had fallen to 17th of 22. Persuasive economic research indicates that this falling relative position of the United States reflects, at least in part, our failure to modernize work supports like public investments in early childcare and education. This means that ambitious proposals to invest in high-quality early childcare and education have a built-in “pay-for”; the economic growth that could be spurred by rising women’s labor force participation. In the longer-term, the payoff to ambitious investments in early childcare and education is even larger. The effect of early childhood interventions are now among the most well-studied issues in economics, and the evidence is clear: high-quality programs yield enormously high rates of return. This conclusion is supported by the highest-quality research and by researchers whose political beliefs span the ideological spectrum. High-quality early childhood education is associated with improved school performance later in life – including higher probability of high school completion, less contact with the criminal justice system, and higher employment and earnings as adults. These benefits are so strong that publicly-financed early childhood educational investments are even a clear net benefit from a strictly fiscal viewpoint in the long-run. That is, the extra taxes that will be paid by beneficiaries of these programs when they are adults, combined with the lower incidence of public benefit receipt means that governments undertaking these investments will see them be fully self-financing in the long-run. This is true even at the state level when some of the benefits “leak” out to surrounding states as some of the children educated in (say) DC move as adults to other labor markets. Crucially, these benefits will also be highly progressive, strongly helping those children from resource-constrained families. 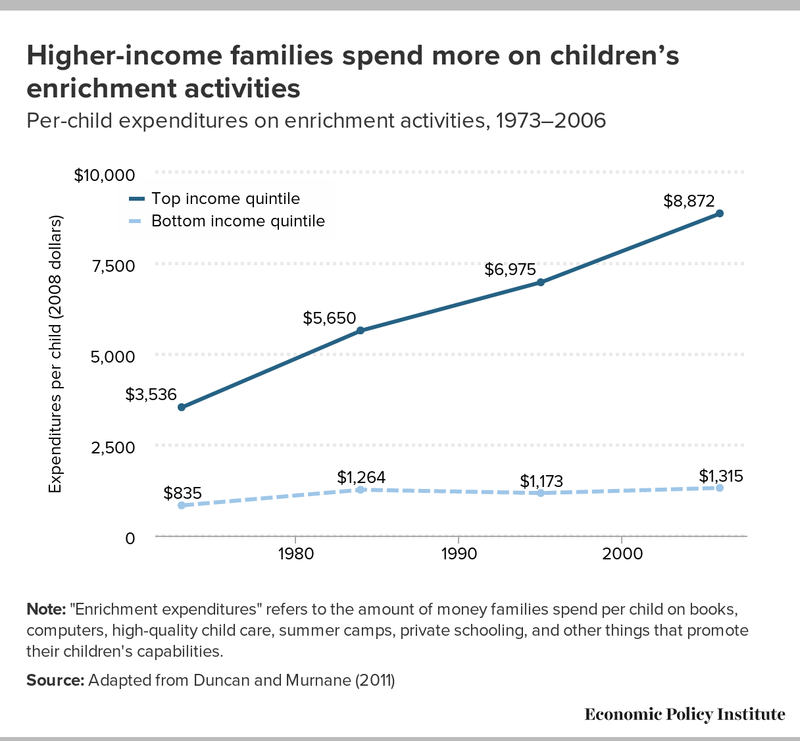 The gap in resources spent on child enrichment by income class is large and has consistently grown over the past generation, as rising economic inequality has given families at the top of the income distribution more resources to spend on everything, including investments in their children (as demonstrated below in Figure 2). This progressive investment in childhood enrichment could help close gaps in school readiness that appear strongly by the time students enter kindergarten. In fact, education gaps by income class seem to peak at age 5, whereafter they are largely ameliorated (if not closed) by consistent exposure to public education (as shown below in Figure 3). But the gaps that appear at age 5 are large, and provide unequal life chances thereafter. Closing these early gaps with ambitious public investment should be a pressing policy priority. Finally, we should note that high-quality childcare is currently too expensive for many families. Our 2016 paper highlighted the cost of center-based childcare across all 50 states and the District of Columbia. 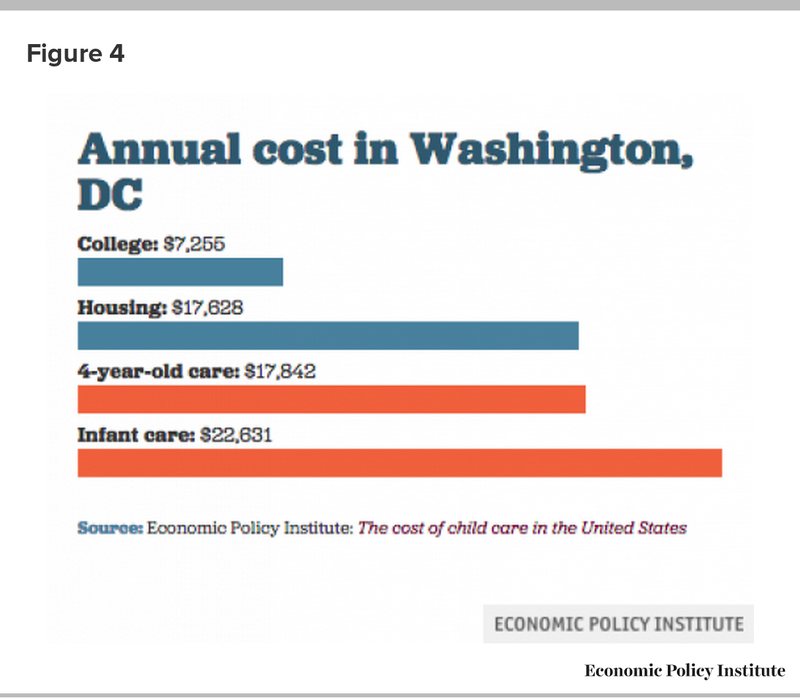 Unsurprisingly, the cost of this care in the District was the highest in the country, with infant care exceeding the cost of college or rent as shown below in Figure 4). And despite its expense to individual families, a genuinely high-quality childcare system would invest more in the childcare workforce. Currently this workforce is woefully underpaid to attract the well-trained and highly-motivated workforce that is needed to maximize the benefits of investments in early childcare and development. Squaring the circle between too-great expense to individual families and too-small pay and investment in the childcare workforce requires a public commitment of resources. But for the reasons we identified already, this public commitment would constitute an extraordinarily wise investment, even in narrow fiscal terms. When the full range of benefits to parents, kids and the childcare workforce are tallied up, the social benefits of ambitious investments in children are staggering. Even better, this is clearly a policy intervention that state and local governments can move on by themselves. They should do so, and, I’m very happy to see D.C. taking steps in this regard. I’d be happy to answer any questions for the committee. Thank you for your time. Josh Bivens, Emma García, Elise Gould, Elaine Weiss, and Valerie Wilson. 2016. It’s Time for an Ambitious National Investment in America’s Children: Investments in Early Childhood Care and Education Would Have Enormous Benefits for Children, Families, Societies, and the Economy. Economic Policy Institute report. Emma García, Elaine Weiss. 2017. Education Inequalities at the School Starting Gate. Economic Policy Institute report. Economic Policy Institute. 2016. 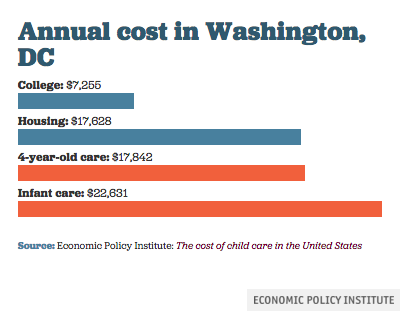 Child Care Costs in the United States. Economic Policy Institute interactive data report.